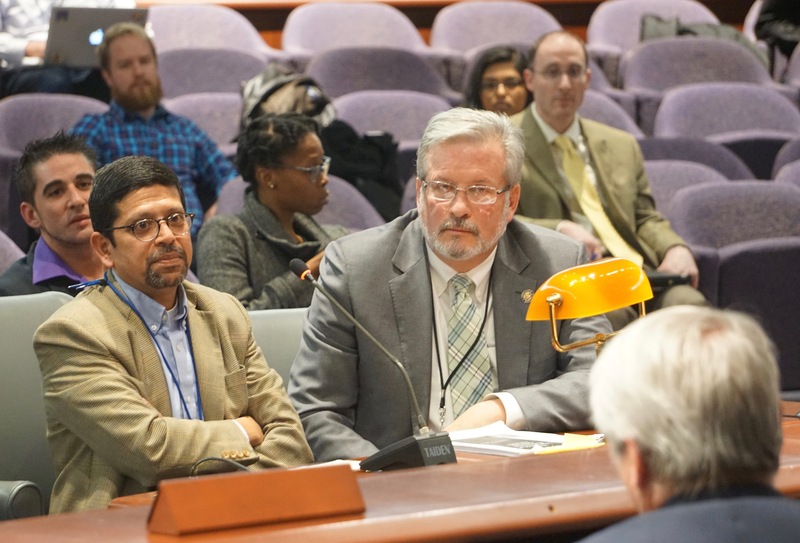 Dr. Deepak D’Souza and Rep. William Petit, right, field questions about marijuana during a public hearing. He was flattered. The calls came from people like U.S. Rep. Steven Stivers of Ohio, the chair of the GOP’s congressional recruiting arm, the National Republican Congressional Committee. But William A. Petit Jr., a state legislator from Plainville with name recognition born in tragedy, was unpersuaded. Petit said Wednesday he is not running for the open seat in the 5th Congressional District, acting on the instinct that framed his considerations from the start: He is the father of a four-year-old boy, a responsibility that meshes poorly with the tasks of raising millions of dollars and mining for votes in a competitive district. U.S. Rep. Markwayne Mullin, a Republican of Oklahoma, called to reinforce the pitch from Stivers that Petit was the only candidate with the standing to clear the field for the Republican nomination and make a compelling case for winning an open seat in a year that is trending toward Democrats. “People appeal to your ego,” Petit said. Nothing, not even Stivers’ insistence he was able to keep most Fridays and Saturdays as unscheduled family time, convinced Petit that running for Congress or serving in Washington would not damage his family. As all of Connecticut knows, it is Bill Petit’s second family. His wife and two daughters were murdered in a horrific home invasion in Cheshire in 2007. His youngest, Michaela, was 11. His oldest, Hayley, was 17, looking ahead to beginning studies at her father’s alma mater, Dartmouth, as a member of the Class of 2011. Petit, an endocrinologist, turned from medicine to philanthropy after the attack in which he was beaten with a baseball bat, bound and tied to a pole. On Wednesday, as he sat in the House chamber, he wore a lapel pin bearing the logo of the Petit Family Foundation he created in the memory of his wife and daughters. He remarried in August 2012 and became a father again in 2013. His boy, William, turns five on Nov. 11, a week after the election. Children change too fast at William’s age, much too fast for a father to fly to Washington every Monday or Tuesday, staying away until Friday, he said. So, this November he will be standing for re-election to a second term in the General Assembly, representing the 22nd House District of Plainville and a small slice of New Britain. His house is about 11 miles from the State Capitol, where he has worked on a number of issues in his first term, including bringing an expert witness to the legislature to testify about legalizing marijuana. It is a part-time legislature, a place where Petit thinks he can make a contribution. The GOP will have to look elsewhere for someone with a profile that could give the party an edge in an unusual race: U.S. Rep. Elizabeth Esty, a Democrat elected six years ago, abruptly announced she would not seek re-election, a consequence of her mishandling allegations of harassment and abuse by her former chief of staff. Democrats have made their own effort to recruit a candidate with an unwelcome celebrity. The Democratic Congressional Campaign Committee has reached out to Mark Barden and Nicole Hockley, gun-control activists since each lost a child five years ago in the Sandy Hook school massacre. Neither has announced a decision.